MD Central Vacuum Installation Hardware - Pipes, Fittings, Tools, Wire. Central vacuum installation is an important part of a central vacuum system. The pipes, connections, and wire are installed in walls, basements and attics with the goal of never having to access them again. The pipe and fittings are unique to the industry and easier to work with than SCH40 pipe. Plus, they are designed to do their intended job well — to carry air and debris from point A to point B. Proper wire and tools are also necessary to complete a professional installation. We have all the parts to install a central vacuum or retrofit an old one. 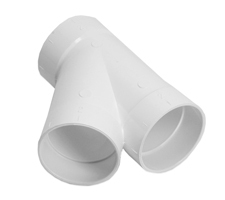 Two-inch outer diameter thin wall PVC vacuum pipe and fittings are standard in 99.9% of every installation no matter the brand. All of the parts used to install all central vacuum systems are only available through online and brick & mortar central vacuum stores, not hardware stores, because the parts are made specifically for unrestricted air and debris travel. Using proper tools during installation ensures seamless transitions, which are critical to the vacuum system's health. 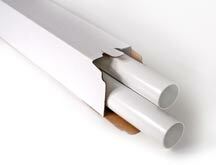 Be sure the installation is done correctly no matter who is the installer. 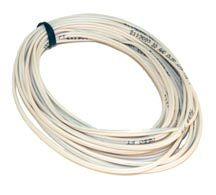 For installations, use insulated low voltage wire specifically engineered for appliances such as central vacuum systems. We suggest nothing less than 24-volt, 20-gauge wire, stranded pair. For runs more than 150 feet, 18-gauge wire can be used. 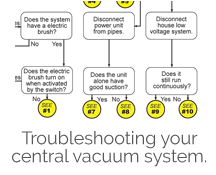 Use these symbols to map out a central vacuum system on blueprints and other home floor plans. 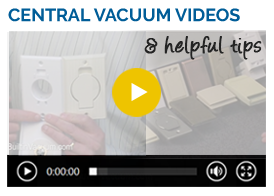 Online resources available for your education: installation manuals, tips, low voltage wire explanation, how to layout a vacuum system, and more.